A quality air conditioning or furnace installation begins with a professional design. The load calculation is where it all begins! Our design prices appear on this page. Also from this page you can go to our system design questionaire and our design order form. Links are at the bottom of this page. Submission of these two forms will help expedite your project. 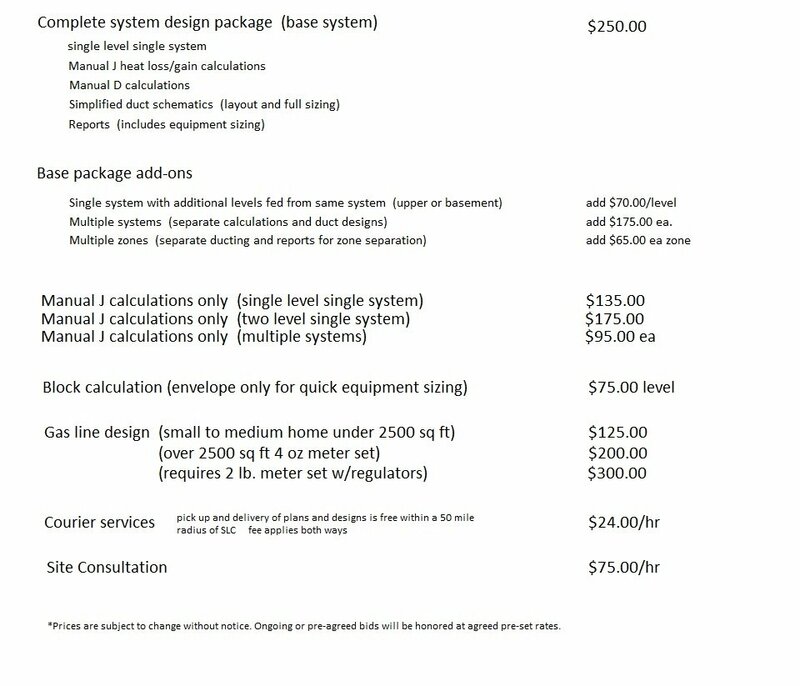 Following are listed our basic design prices for our services. Bulk design pricing for multiple projects, such as condos or apartments, can be arranged. Large residential projects requiring separate calculations for multiple systems (3 or more) may be bid upon request. Please contact our designers via the following e-mail form. *Prices quoted below are based upon project size of 2500 square feet or less. Larger projects, please contact us for pricing. Establish initial contact via above E-mail Form, Information Request Form, or phone 801-300-5118. Price for our services is agreed upon (E-mail confirmation or phone). Send payment by personal or business check, money order, or cashier's check. Visa, Mastercard, or Discover Card payments are accepted only through Paypal. Other forms of payment are accepted through Paypal, as well. American Express payments will be accepted only through Paypal.